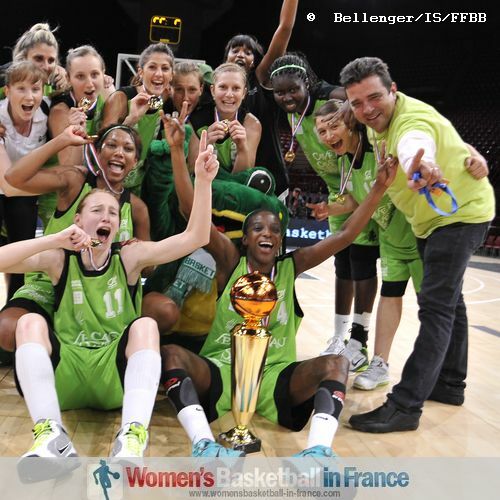 Aida Fall picked up her second Trophée féminin Coupe de France winners medal in helping US Laveyron Drôme in beating Cercle Saint Paul Rezé (73-68). The Senegalese international scored 24 points and collected 7 rebounds. She was also fouled 10 times. US Laveyron and CSP Rezé were both relegated from the second division last season (NF1) and are currently battling in the play-offs to regain promotion to LF2 next season. In their only meeting this season, three weeks ago US Laveyron came out on top (67-51) and were favourites for this final. Both teams started the contest cold with just 8 points in the first four minutes (4-4). US Laveyron then took control of the game. With three minutes left to play in the first quarter they led (14-6). 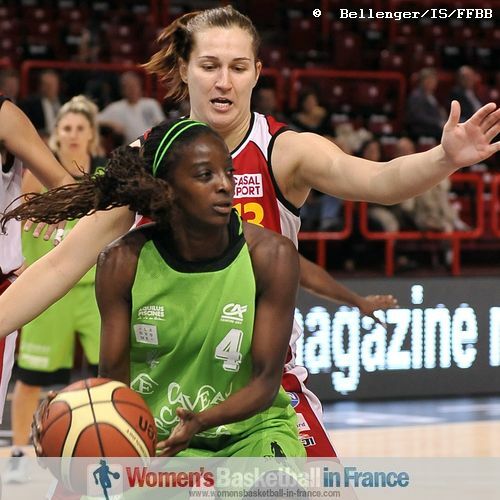 Pulchérie Ayi (left) and Cheryl Madelon's good work was not rewarded as their side went to sleep allowing CSP right back in the game, reducing the advantage of Laveyron to 2 points (20-18) going into the second quarter. The second quarter was more of cat and mouse with neither side able to gain control. Florence Genier was the main reason that CSP led for most of the second quarter. However Laveyron were able to take a 1-point advantage going into the locker room (33-32) thanks to Elena Visnyakova. The game improved in quality and intensity during the third quarter. CSP played the better basketball and with a couple of treys by Elisa Diatta and the hustling of Maria Vincente Santa Cruz they went 9 points clear with 13 minutes remaining in the game (46-37). Laveyron responded with shots from beyond the arc by Malden and Katarina Simkulakova but still trailed by 7 points going into the final quarter. CSP continued to dominate the affair and with five minutes left to play they led (58-48). However the pendulum started to swing the other way with US Laveyron scoring 9 unanswered points: Fall 4, Visnyakova 3 and Vanessa Candelier 2. The battle became very intense with US Laveyron finally drawing level with back to back shots from the land of many (64-64) entering money-time. Candelier put US Laveryon in the lead for good with 40 seconds to play with the last points in open play (68-66). The rest of the scores came from the free-throw line as US Laveyron held on to win (73-68).